Lot of time customers ask me when should I start planning my retirement savings, the answer is now , the day you get employed you should start planning your retirement and the chief reason for that is effect called Compounding ,given below is an example if you save Rs 10000 per month how will your retirement corpus change at various rates of returns, if you manage 12 % annual rate of return, you will have a retirement corpus of 5.5 crores versus 3 crores if you just start 5 years early almost 80 % more. Secondly,long-term inflation trends are hard to predict, u never know how macroeconomics will influence long-term inflation trends , see the chart below how inflation has fared in last few years. 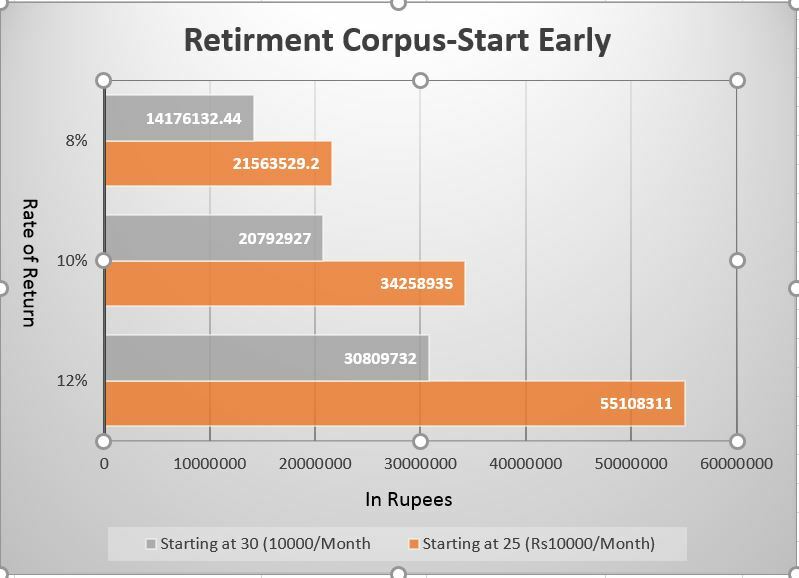 READ Comparing NPS and EPF- Which is better?